Ask fellow campers about "Cougar RV Park and Campground" and nearby attractions. The owners where super friendly and awesome hosts. Will definitely go again, beautiful campground. We camped at Cougar RV Park and Campground in a Tent Trailer. Lake and river fishing, mountain hiking, waterfalls, nature trails, white water rafting canoe and kayaking, hunting, hot springs and just relaxing. The owner is the nicest person! Our site was on a grassy knoll, probably had a lovely view but it was rainy when we were there. I was grateful for the grass (instead of dirt/mud). The 2 restroom/shower rooms were older, but clean. 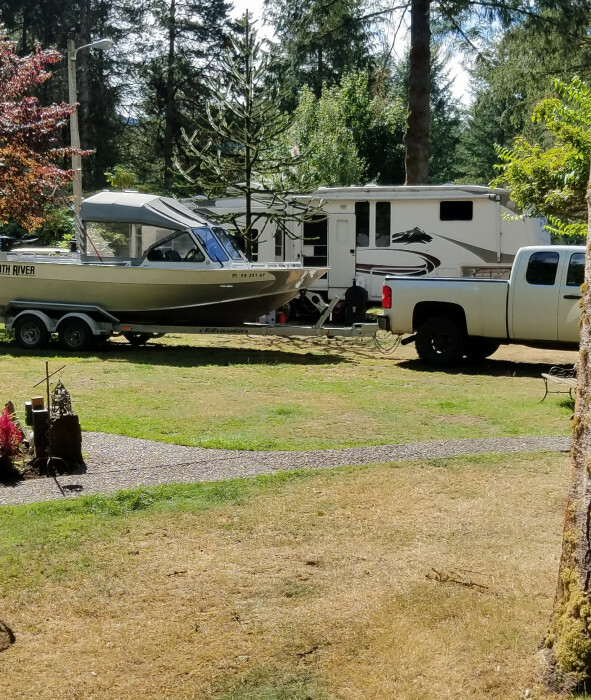 We camped at Cougar RV Park and Campground in a Truck Camper. If you wish to visit Mt St Helens, this is on the southern, less-scenic side; and it's a long drive to get to the visitor's center on the NW side. Love the mountains so this place is great. The owner is a very nice person and does her best to accommodate everyone. She makes it a point to say "hello" to everyone. Bathrooms are clean, yet busy. The fans in the bathrooms need to be repaired though, otherwise, you sweat to death when you take a shower. No concrete pads, but that is expected in a mountain park. Very clean and no problems with the long-term RVers. Wi-Fi is pretty good for the most part. No cell service, but we were not complaining. Satellite is hit and miss, depending on your spot and if it is obstructed. Owner does her very best to accommodate each camper, either with or without full services, tent or RV. We will definitely stay here again. 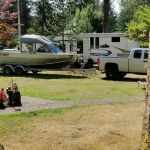 We camped at Cougar RV Park and Campground in a Fifth Wheel. Cougar RV Park made our hunting trip really worthwhile. They were located very near the area we were hunting (within 10 miles), they also were located very near the local grocery and restaurant. They had a great area for tent sites and for RV's and let us combine our huge party in a very large site and didn't even charge for every site we actually took up. Although we were there during a slow time in the season, they didn't seem to mind us taking up the whole east side of their park at all. We all had a great time. The facilities are very quiet, well maintained, and provide garbage facilities at all sites. The restrooms were really clean and well stocked and no charge for a shower! We really cant wait to get back to this park next year. We camped at Cougar RV Park and Campground in a Motorhome. Are you affiliated with Cougar RV Park and Campground ?